“T” here, and a question many of the ghouls — I mean, girls — I teach often ask around this time of year is “What candy can vegans eat?” I think they’re really just trying to get a class-time party out of the situation and this is their way to broach the topic, but I always take the opportunity to remind them that we CAN eat anything we want, but we CHOOSE to omit certain foods and practices from our lives. But honestly, this is a great time to revisit that question and to help you all decide what sort of treats you want to put in those little tricksters’ bags when they ring your doorbell on that hallowed eve. 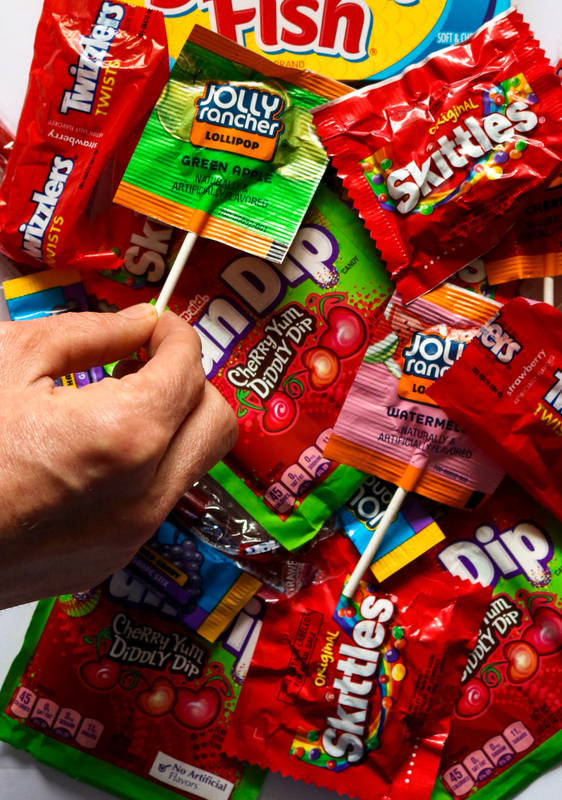 Before we begin, let’s clarify one thing: This is a post about candy. Yes, we know it’s not necessarily healthy, but it’s Halloween and the beginning of the eating season. These are the candies I have ALWAYS loved and these are the candies I jumped with joy about upon finding they were clean of animal products. I don’t consider myself much of a sweet-eater, but when these are in my proximity… I lose all self control. Sour Patch Kids – The sour to sweet flavor of these little delights can do the same for my disposition almost any time and turn it from sour to sweet. These kid-shaped candies came out in the mid 1980s when I was just beginning high school and gaining my “more sophisticated palate” in the world of sweet AND sour. Twizzlers and Cherry Nibs – For the “red-licorice-only-no-black-licorice-for-me-thanks” crowd, these two are always certain to please. Strawberry and cherry goodness in a variety of shapes and sizes. And, for the record, I am also a BIG fan of black licorice!!! Goldenberg’s Peanut Chews – The dark chocolate version of this “Philly born and raised” confectionery masterpiece is vegan, but they recently introduced a non-vegan milk chocolate version as well. Just make sure you get the ones with the RED and brown wrapper. FUN FACT: These delicious molasses-based bites started as a high-protein ration bar for soldiers during World War I and were manufactured right here in Northeast Philadelphia (where we’re from!!) since the EARLY 1900s before moving to Bethlehem, PA in the early 2000s. FUN FACT 2: For the past 40+ years I’ve been calling these Goldberg Peanut Chews and only realized the mistake upon researching this! 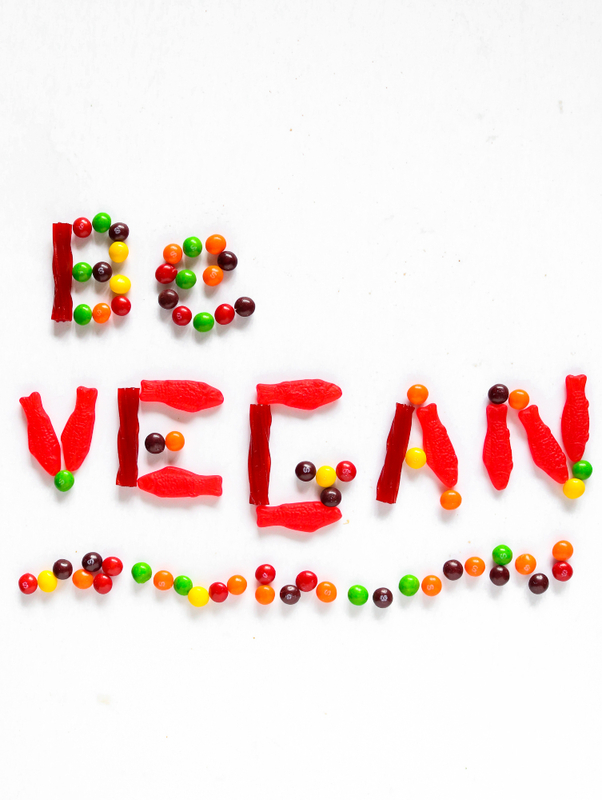 Skittles – You can continue to “taste the rainbow” guilt-free now that the manufacturers of Skittles stopped using carmine, gelatin, and confectioner’s glaze (read: food-grade shellac) in these tiny orbs of fruity goodness. Nerds – a box of these tiny tasties is always appreciated in ANY trick-or-treater’s sack of goodies! Jolly Rancher – I was tempted to put this in the next category because I’ve always viewed these as lollipops without the stick, but I thought I’d close this category on a more positive note. Lol. EDIT: I just found out they make these as lollipops too! hahahaha!!! ON THE GOOD SHIP LOLLIPOP! dum dums – (also, see previous category) These diminutive delights are ALWAYS a hit. Don’t be a dum-dum yourself, and be smart enough to grab more than just a few for later days. Ring Pops – Seriously, everyone loves this edible, wearable accessory. Tres fancy! Dots – Super gummy goodness without the gelatin. Careful of lockjaw if you try to eat too many of these at once. Chuckles – The five-flavored sleeve of sugar-coated finery is a jelly-candy lover’s delight. JUST THE STRAIGHT SUGAR, THANKS. Pixy Stix – This elongated cylinder of sugar is sure to make every child happy and every parent exhausted…give the kids three. 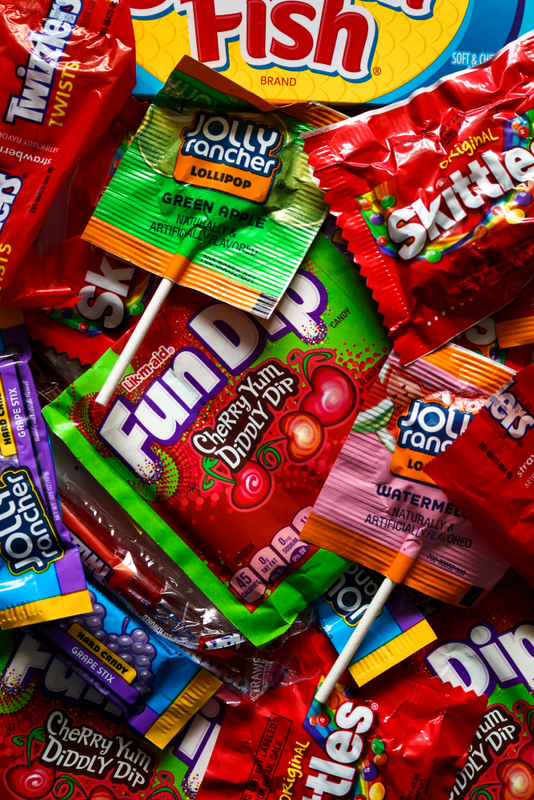 Fun Dip – for those who prefer their flavored sugar from a pouch of sugar eaten with a sugar stick. Smarties – American Smarties are vegan and are pretty much just a sugar tablet. The candy sold under the name Smarties in America is sold as Rockets in Canada (where Smarties are candy-covered chocolate pieces). Hope that’s confusing enough for ya! Starbursts – In the UK these are clean of animal products, but in the U.S. they contain gelatin (check out a similar candy Mamba for a gelatin-free Starburst-like candy). SweetTarts – Basically Pixy Stix in pill form, the original version of these candies are vegan, but the “chewy” version contains albumen (egg whites). 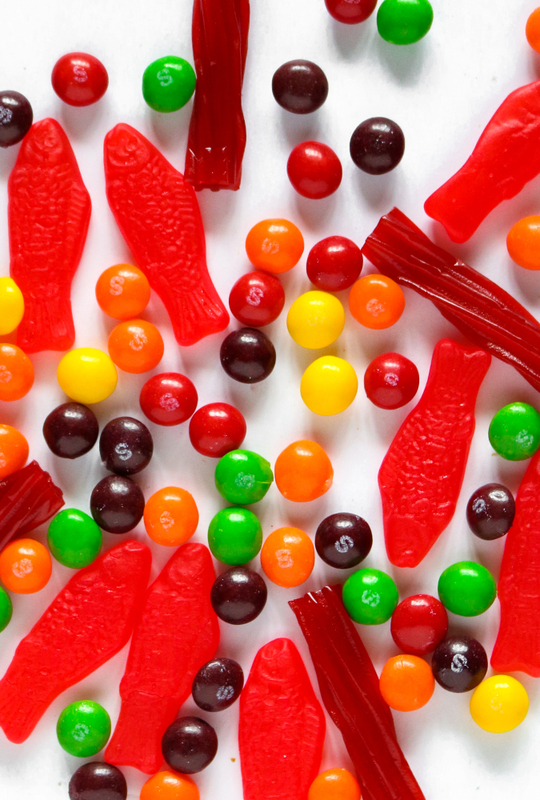 Swedish Fish – Depending on where they are manufactured, some packages of Swedish Fish contain beeswax. I have also read that ALL the miniature bags of Swedish Fish contain beeswax. 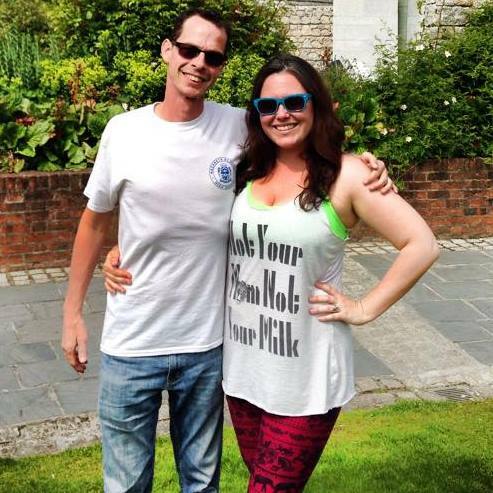 Apparently, size does matter. READ THE PACKAGE ON THIS ONE!!! Laffy Taffy – In another SDM moment, I’ve just read that the large versions of this candy contain egg, but the smaller, “fun size” ones do not. Again – and always – read the ingredients. There really is quite a cavalcade of candy available on the market that does not incorporate animal products in their ingredients, so I have not listed ALL of them here; but I’m certain you’ll come across a few of your old favorites that you may need to sneak to a safe area before giving them ALL away to little princesses and pirates seeking their loot and booty. If you enjoyed this vegan candy guide and want to learn about how you can re-make some of your old favorites in your own kitchen, you’ll probably love our round-up of 9 Vegan Sweets for Your Grown-up Trick-or-Treat Bag!